The time had come for my first winter endurance race, Rovaniemi 150. In 1997 I did my first road cycling race. 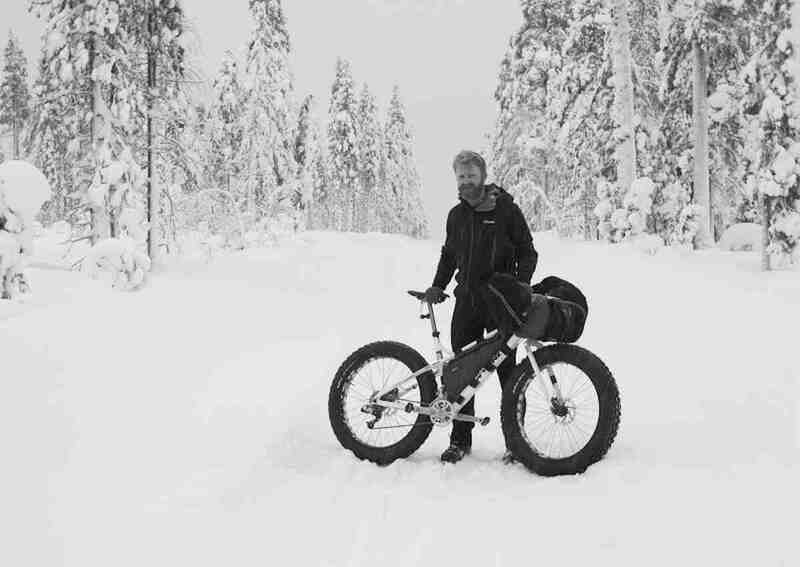 If someone would have told me that 16 years later I would end up doing a 150km winter race on a very challenging route in Lapland, I would have had a hard time believing it. But here I am, writing a race report of it. The lead up to this race was very interesting. After the LEVI24 in 2009 I didn't do a long race (for me, races under 10 hours are not long) until Mammoth March Impossible in October 2012. And that was an incredible sufferfest. Overall, in 2012 I sometimes had a feeling that maybe my endurance career was over. But after Mammoth things started to get better. I thought that maybe the “old me” was still there and I could at least survive Rovaniemi 150. My preparation for the race was good, and you can read about it from the 45North Chronicles. This time of the year it's usually cold in Rovaniemi, and a week before the race temperatures ranged from -15 to -25°C. 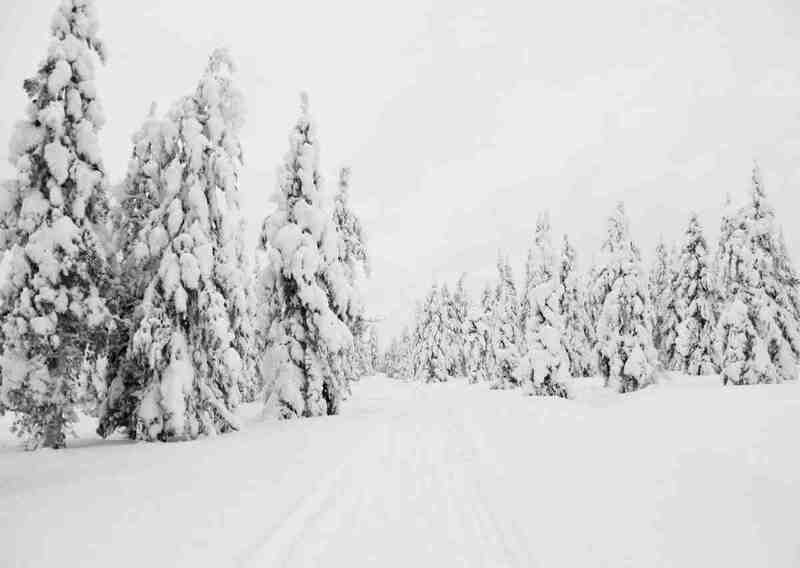 But the weather can be tricky in Lapland. The temperature rose to -1°C during the last days before the start, and was forecasted to be just that during most of the race. That would mean soft and slow trail conditions. Cold weather would have suited me better too, not only because of better trail conditions but I can withstand cold temperatures fairly well. I had a real headache on Friday, due to not sleeping well in the train, but I felt good on Saturday morning before the start. The start was good, and I was in second place at checkpoint 1 (Porohovi 1). 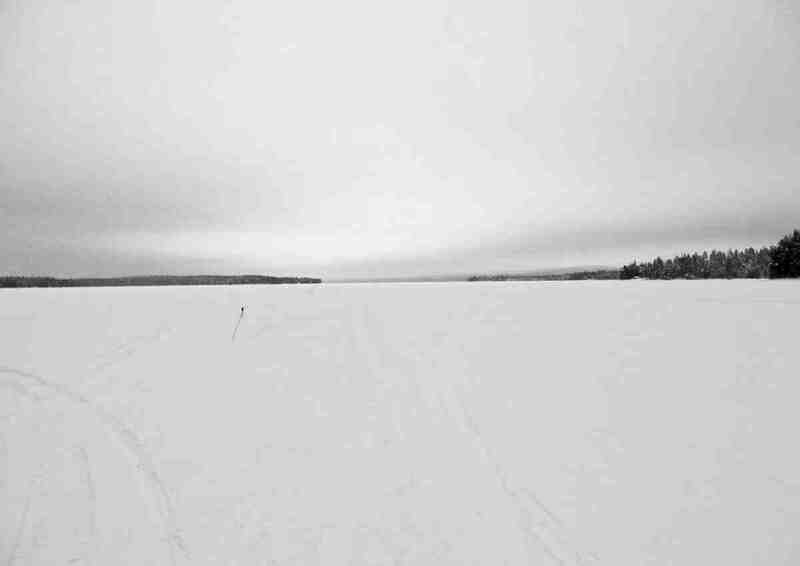 The first section runs on the river Ounasjoki and is part of an official snowmobile route, so it was well groomed, but the conditions were soft. I was running my 45North Dillinger tires with a pressure of ~0.3-0.4 bar / ~4.5-5.8 PSI, and as expected, they worked really well. After Ounasjoki the route turned to west and a long, long uphill followed. I was riding with John Ross. The scenery was stunning! 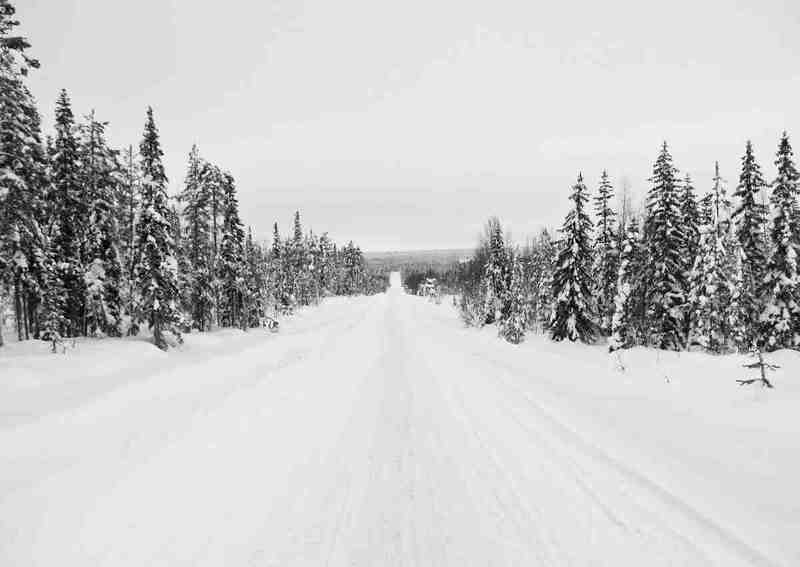 The forest road was followed by a snowmobile track that was fairly soft, and most of it had to be pushed. I was third in the checkpoint 2 (Sinettäjärvi) and I was riding alone at this point. Next up was a very narrow, soft trail through a forest with lots of twists and turns, and after that came the long stretch of lake Sinettäjärvi. It went really well too. There were a number of overflows, and one of them forced me to stop. No problems there, because the 45North Wölvhammer boots are 100% waterproof. The boots worked again perfectly the entire race. After a gravel road section came a big road. One car (most likely part of the volunteers) from the opposite direction stopped to take photos. I continued riding but started to feel that something is wrong because I didn't see any signs on the sides of the road for a turn. I checked my position, but was still unsure if the turn was still to come. A car of the organizers stopped there too and a guy told me that 'I have probably passed the turn'. I was furious. I couldn't understand how that was possible. I had ridden about two kilometres past it. I rode back and now there were more people directing participants to right track. It turned out that the car with the photographers covered the junction so I didn't see the signs! I lost a couple of places but was able to reel in and I was soon together with Jarmo Järvinen, the only other Finnish participant, in 4th place. We were again on a snowmobile track with a long uphill. This route was definitely tough! It was pushing time again. We arrived together to the checkpoint 3 (Vittavaara) at 44.28 km. My 1,5 l hydration pack (with sports drink) was almost empty, so I refilled it. I had more sports drink powder in my frame bag. This was part of my strategy for hydration. My energy level was fine but I had a little hard time to eat some of the energy gels, because they are just too sweet and oversaturated with sugars. I had also the usual chocolate and musli bars, and Flapjacks. Even them didn't feel too good but I was ok.
After checkpoint 3 I was able to ride a fairly long section of the snowmobile track, and distanced Jarmo. A gravel road section followed, and then back again to snowmobile track heading to next checkpoint, 4 (Morajärvi) at 58.38 km. It was mostly too soft to ride so I was marching with my bike again. Pushing wasn't that bad, because the track upheld walking fairly well and feet didn't sink deep. And, the scenery was so, so beautiful! Darkness started to descend. After a lot of pushing I was with Jarmo again, and one of the “craziest” sections was upon us. It was a narrow track, opened with snowshoes. Now, here the track didn't uphold walking and almost every footstep was over knee deep. I liked it a lot and it was fun! After checkpoint 4 (Morajärvi) I distanced Jarmo again and was able to ride almost all the way to the next one, checkpoint 5 (Peurajärvi) at 69.70 km. I was 10 hours into the race, and my energy level was now lower. I had three outdoors meals with me, and I knew that soon I had to eat one. I wanted to get to the next checkpoint because after that there would be the long road section and the checkpoint after that is still far away. The section between checkpoints 5 and 6 (Kuusilampi at 78.30 km) was very slow and I was practically pushing the entire time. Although it was dark, I saw the trail and surroundings very well with my lights. And the surroundings were amazing! 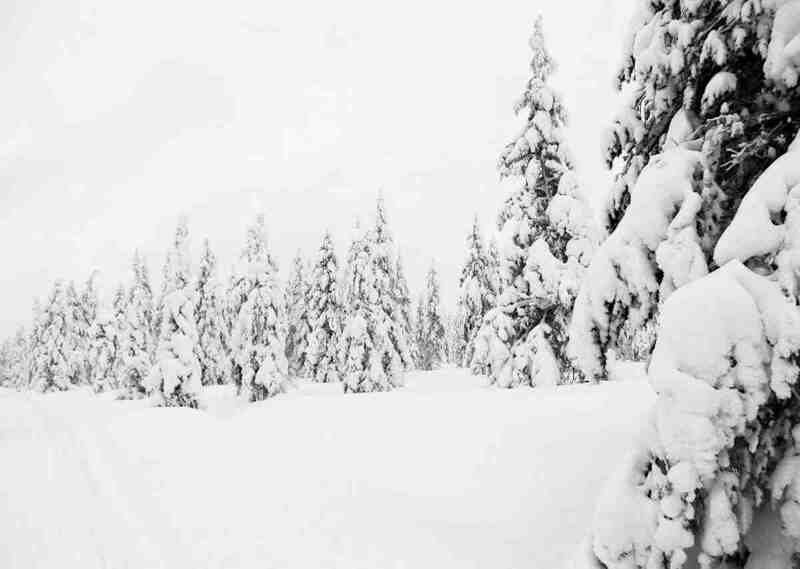 The trees were thin and high, like giant snow pillars! Checkpoint 6 had a warm hut, and there was hot water too. I prepared my meal and had a nice chat with the volunteers. After a while Jarmo came in. I continued alone. After the warm hut it felt cold outside, so I wore my down jacket to warm up. Again, it was mostly pushing until the next road. When the road got bigger, I significantly increased my tire pressure with my mini pump. I was able to ride the long road section very well and fast, and I was using the biggest chainring most of the time. 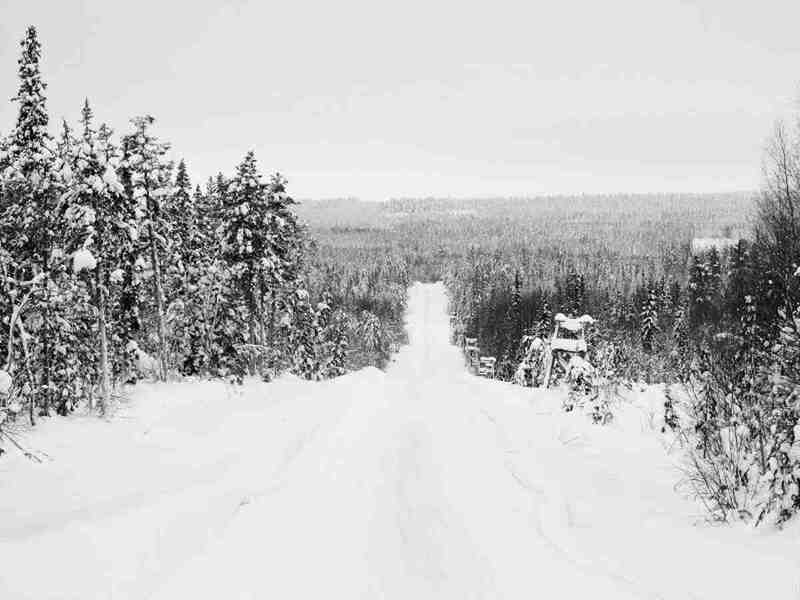 After the road section came a surprisingly long snowmobile track to the checkpoint 7 (Toramokivalo at 113.10 km). It was really tough going and I was getting tired. I decided to eat another meal at the checkpoint 7. Like at all of the checkpoints, there was a nice campfire and great volunteers. Jarmo came in again after a while and seemingly had a good pace. He had a short break and left the checkpoint just before me. This was a crucial point for me in the race. After eating the meal I really started to feel tired and sleepy. There were long uphills, and I pushed my bike, but my eyes just wanted to close. After 19 hours I decided to bivy and take a nap, because it felt like otherwise I just could not continue the race. I knew that the next rider behind me was a couple of hours away, and was actually the tandem pair. I rolled my sleeping pad on the snowdrift and decided to only wear the down jacket, and not use my sleeping bag, because the temperature was about -5°C. The break took slightly over an hour, and I felt better again. I was joined by the tandem, but I distanced them when the track was rideable again. On Lake Norvajärvi I felt good and confident and without any crisis I would keep my 5th place position. 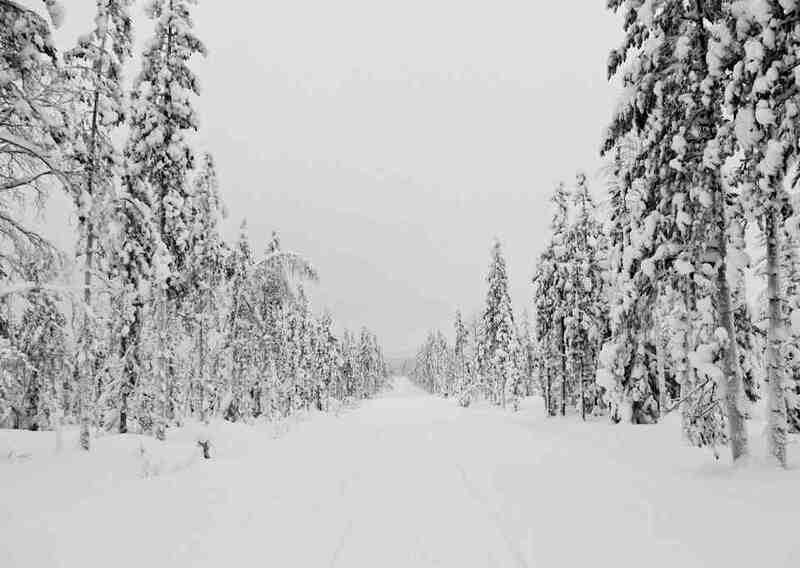 After Norvajärvi came a long and tough snowmobile track with pushing, but it then improved and was rideable. This place really had the winter endurance racing feeling all over it. Alex, the race director, came with a snowmobile and I had a short chat with him. I told him that now I was feeling fine but at the 19 hour mark I was really sleepy. After this great section came a short road before the last, same stretch as in the start, the river Ounasjoki. On the road, I met one volunteer with a snowmobile and he took a couple of photos. My break at checkpoint 8 (Porohovi 2) at 137.64 km was short, three minutes, but I had a good feeling that I would ride to the finish and keep my 5th place position. The last ~13 km felt really hard. Several snowmobile safari groups came from the opposite direction and the surface was soft after them. 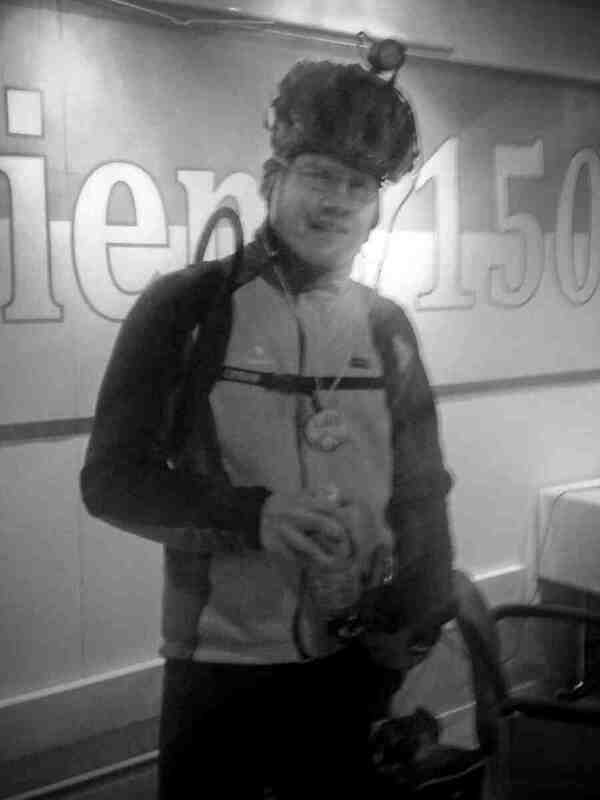 After 26 hours and 54 minutes, at 5th place, I reached the finish at Hotel Pohjanhovi. As I walked inside the hotel the Brits (John Ross, Ed Oxley and Brant Richards) cheered and I waved my hand - I did it! The race was truly an outstanding experience. My plan for the race was very simple: just keep moving and don't give up. I had to 'improvise' a little after 19 hours, but otherwise the race went better than I expected. Considering that my training has been compromised a lot with a full-time job and everything else in life, I'm very happy with the result. It reaffirmed that I'm an endurance guy. With better training I know that I can improve and this race will definitely be my goal again next year. My family: wife and daughter. You are my inspiration! 45North, my main sponsor. Your products were instrumental for my result, and the partnership has been a huge morale boost. Alpkit, another vital kit sponsor. My mother and father, a very important part of the 'Team Lund'. Mark Roberts, Peter Nylund, Matti Hallikainen, my big bro Tatu Lund and everyone else who sent encouragements on Facebook! And of course all you blog readers who still keep reading my stories! And thanks to race organization and the volunteers. Alex, you can be proud of your work and your team, you organized a fantastic race! The race route is awesome and excellent, and so beautiful! I hope to see you again next year!